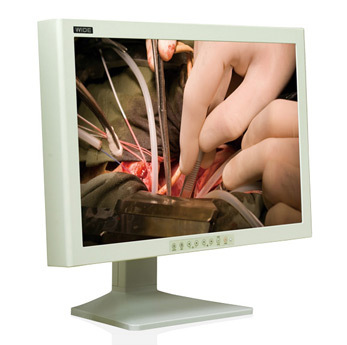 WIDE SD2400CW - it is a digital color video monitor in a medical version with LCD display 24'' (518.4mm x 324.0mm) for operating rooms and video stands supporting Full HD 1080p and DICOM display, capable to transmit 16.8 million colors. Surgical monitor WIDE SD2400CW is made in accordance with all the requirements set to the monitors that are replaced in the operating rooms - the buttons have a membrane structure, the screen is protected by a special glass, a special form of ventilation holes is designed on the back wall of the pressure hull, which prevent splashing and settling of microorganisms on the internal surfaces. 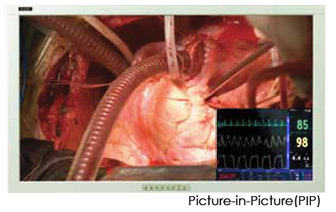 This monitor has all possible video inputs for signals used in modern medical video processors and video cameras. 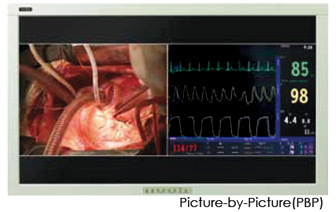 Widescreen medical monitor WIDE SD2400CW can support simultaneous operation with two sources of video signal in PiP Picture-in-Picture (PIP) and PbP Picture-by-Picture (PbP) modes.